One of the benefits of my house is that I have a corner block and thankfully the longer side of my block is in a quiet street. The bad thing obviously is how much mowing we have to do! Last year I took a cutting from my large frangipani tree and eventually this ended up on our nature strip (verge). This year I planted a Mulberry tree in my house, but unfortunately I didn’t choose the best location. Rather than remove the tree altogether, I’m going to try and move it to my nature strip. I’m not sure if I’m really allowed to do all of this. My Council is not one of those Councils that encourages verge gardens. In fact, my Council strongly discourages this. Not all Councils are like mine however. 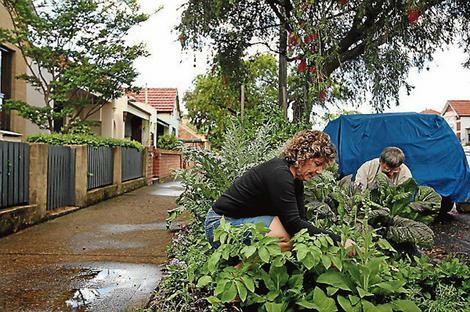 Some like Marrickville and City of Sydney Council are actively encouraging residents to plant and maintain verge gardens. A friend recently shared this video of the City of Vancouver and its verge garden revolution. However planting trees is one thing, planting vegetables quite another. When I first saw this video I liked the story behind it, but then thought ‘hey having vegetables grown so close to the road and encouraging their consumption – is that good?’ so I decided to find out. My initial reaction really had to do with fumes from cars and run off from the road and houses entering the soil and thereby being taken in by the plant. Was this safe? Well after much searching, I may have found the answer. Lead is one chemical that can have significant health impacts to humans, especially children. Exposure to lead can lead to brain damage and impaired intellectual development. In Australia lead was prevalent in houses (paints) and petrol. But its use in petrol was phased out from 1993 and in paints from the 1970s. Therefore, as most of the toxic issues related to verge gardens would be related to lead poisoning, that’s a good thing. But that’s not the end of the lead story. Lead would not only be found in the soil on your verge, it would also be found in ordinary homes such as mine. Depending on the age of your house, if lead is likely to be found in paint work, it may be best to leave it alone. Similar to asbestos, if lead is left intact it is not likely to cause harm. It will cause harm if you damage it and disturb it so as to create dust. If this dust is inhaled, touched or let to settle on soil, that’s when problems may start to arise, particularly for areas where food may be grown. A study by Macquarie University found that children were most at risk in that they absorbed more lead than adults. The study also found some plants absorb more of this toxin and then pass it onto people than others. Leafy vegetables such as lettuce, spinach and silverbeet were the worst offenders (sources: 1, 2 & 3). While all of this may seem scary, there are ways to address this. Firstly, it is very important to test your soil before growing any food. Another way to address this is to have raised garden beds which is what I’ve done. Apart from the toxins issue, those opposed to verge gardens may cite safety issues which are perfectly valid. These really have to do with the maintenance of the plants planted to ensure they don’t impact people’s ability to use footpaths and to ensure they don’t obstruct visibility for motorists. These issues are easily addressed however by having a set of guidelines in place for those that want to plant on their nature strip. Other management issues with verge gardens include the application of chemicals such as pesticides and fertilisers running off into the stormwater system and ending up in creeks and other water bodies. Again, this is where having a good set of guidelines that encourage organic gardening techniques would come in handy. So with my health concerns related to verge gardens allayed, I hope to see more people participating in gardening. 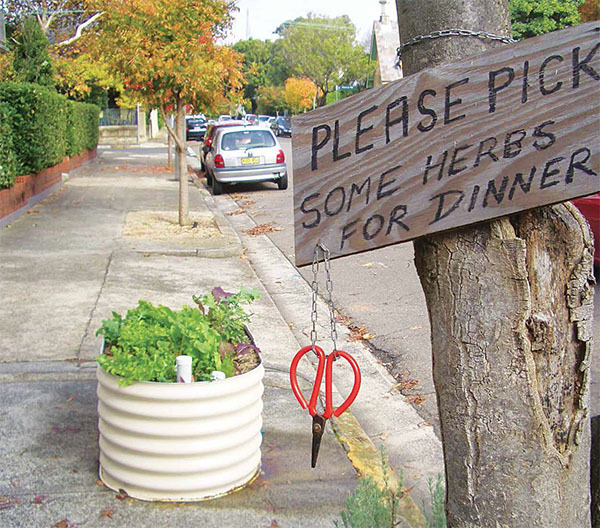 Participating in local urban farming whether through a verge garden or a community garden can only be good. To find out whether you are allowed to plant a verge garden, contact your local Council and read the City of Sydney guidelines. Also, the presenter of one of the shows that I really enjoy watching is a big advocate of verge gardens. You can also check out Gardening Australia’s take on this through this LINK. There are loads of videos in the 2012 archives. If you already participate in a verge garden or a community garden, let me know your thoughts and share your story and pictures. I’d love to hear from you! ~ by em0navari on February 22, 2015. This entry was posted on February 22, 2015 at 10:49 am and is filed under Eating, Gardening, Green Home.You can follow any responses to this entry through the RSS 2.0 feed.You can leave a response, or trackback from your own site.